Most travellers from Lombardy to the Germanies take the road up the Adige from Catullus’ Verona past Trent of the council. When they come to Bolzen beneath its castles the road divides to the right and left and they can follow the Eisack towards the Brennerpass or the Adige (now called the Etsch as one moves into German-speaking areas) towards the Reschenpass. In rich and well-organized ages, most travellers prefer the first route, because the Brenner has certain advantages if one can build bridges and cut roads and drive tunnels through the most difficult sections. If they take the second they will find themselves in a district called the Vinschgau where the fields yield rye more readily than wheat and the orchards apples and pears more readily than grapes. In that district on the bank of the Adige is the remarkable town of Glorenza. Take some time to impress the geography on your mind (another good map is here). Glorenza lies between several other large villages or small towns where the roads over the alps towards North Tyrol and Swabia, through the alps towards Switzerland, and downstream towards Lombardy and Veneto come together. The valley bottom provides irrigated corn fields and orchards and hay fields, while the slopes and foothills provide pasture and woodland. 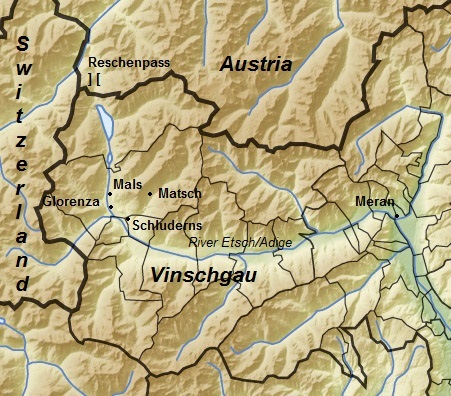 For about a thousand years the Vinschgau was a trilingual district, with the farmers speaking Rhaeto-Romance, merchants and travellers from the south Italian, and the lords and travellers from the north German. 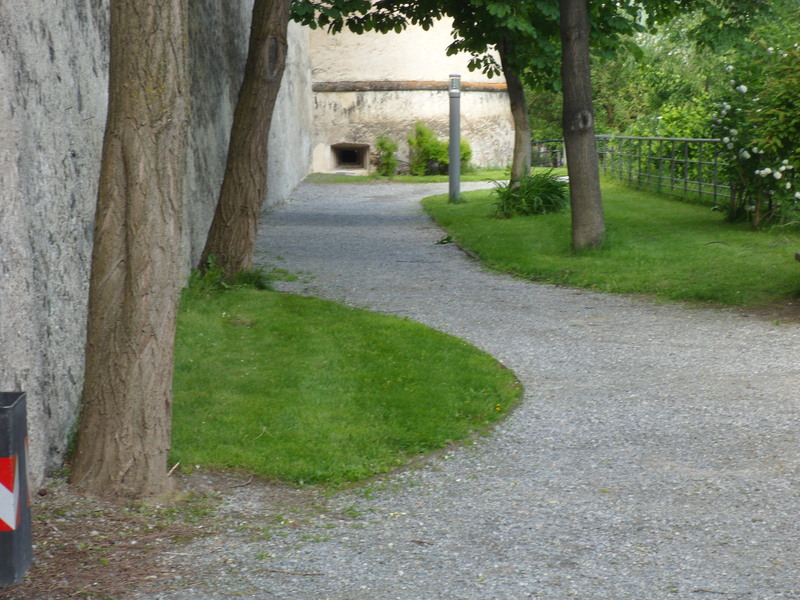 An alley in Glorenza. Photo by author. Modern Glorenza is a product of the Battle of Calven between the Swiss Confederacy and Archduke Maximilian of Austria in 1499. 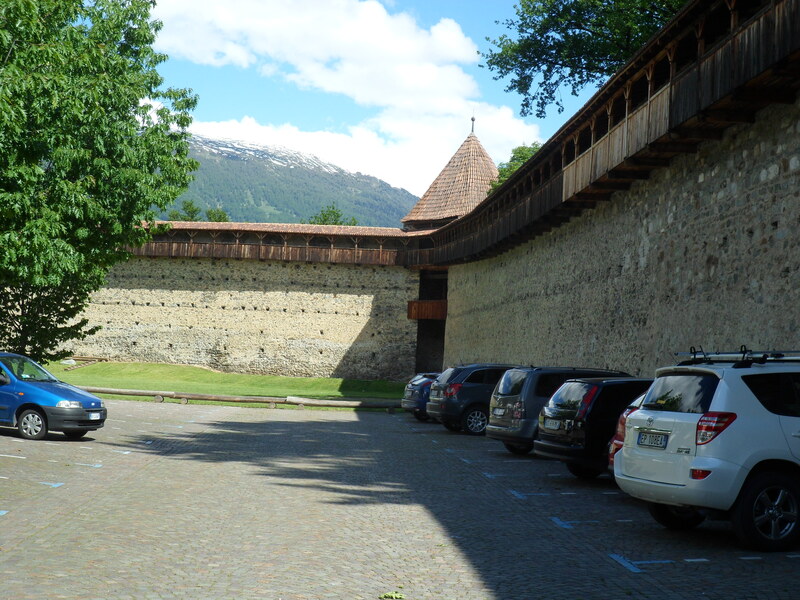 The victorious Swiss sacked the town of Glorenza which consisted of a single street 100 metres long with arcaded houses on either side and a wall with tollgates at both ends. Maxillimian resolved to build a bastion in the upper Etschtal to defend it against further Swiss attacks. His engineers laid out a new town about 400 metres long and 200 wide enclosing the ruins of old Glorenza and the former village and fairground outside the walls. Like most premodern towns, the walls contained plenty of space for gardens and camps and new construction. Maximillian’s Glorenza (which he would have probably called by the German name Glurns) had room for several thousand inhabitants before the walls would need to be expanded. The guide tells me that the walls are now 9 to 12 metres high. In his story the fortifications built between 1500 and 1520 consisted of the main wall, an outer wall 5 metres high, a ditch, and a bank and palisade, all concentric with the same trace. By my measure the walls are three or four feet thick at the base. Ten metres is a traditional height, since it is at the very limit of what can be scaled with a ladder. Much higher added cost for little military benefit, while much lower was vulnerable to a sudden rush. 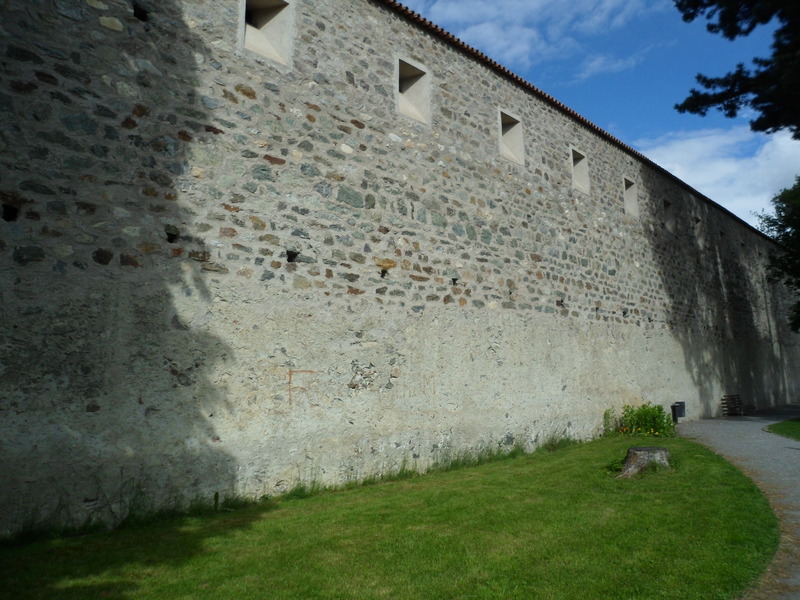 The inner face of the wall by the St. Pancratius gate. Photo by author. 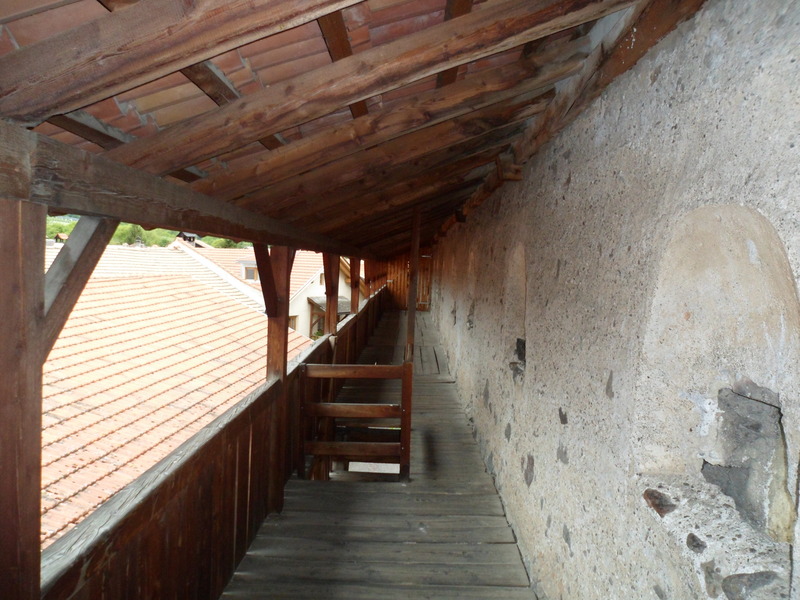 Rather than battlements, the walls were fitted with a wooden gallery with a roof and loopholes. 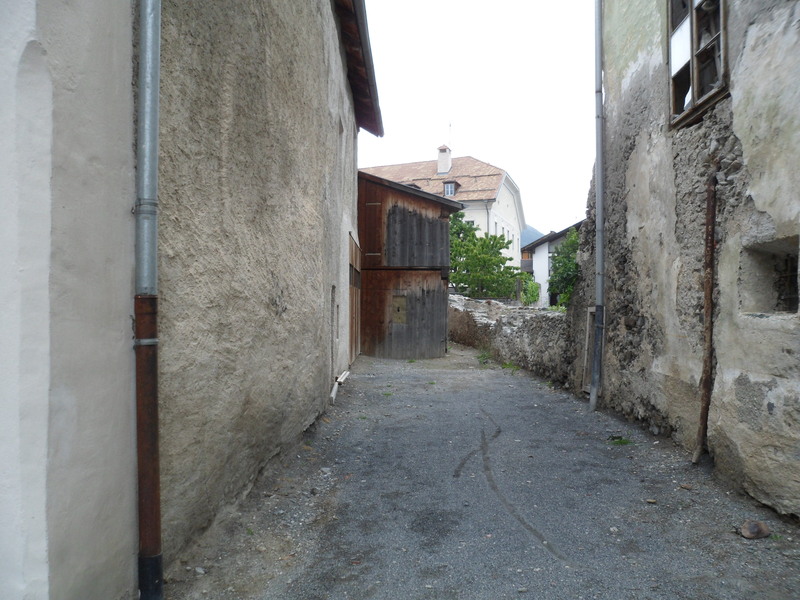 As the town stagnated, the walls were left to rot into a state like this. Note the putlog holes which the builders used to anchor their scaffolding. Since the 1980s, some sections of the gallery have been reconstructed. I paced the gallery out; in each nine feet is a loophole, its breadth one foot. The guide tells me that the loopholes were modified shortly after the walls were completed in 1520. About that time everyone who could afford to do so was replacing their crossbows with arquebuses, and these required smaller loopholes. The engineers filled in part of the old loopholes with brick and stone and timber slanted so that defenders could still shoot into the space between the outer and inner walls. 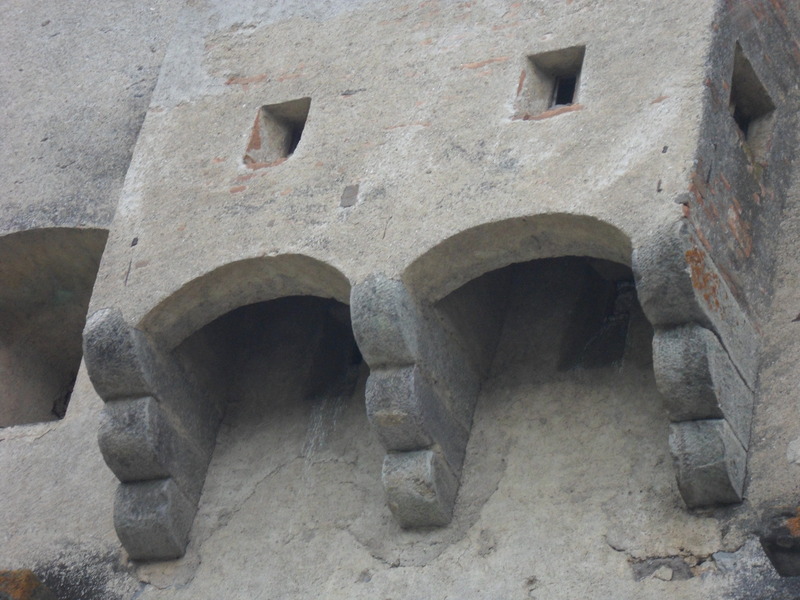 The walls are strengthened with six rondels (four at the corners and two in the long walls). They are not much taller than the walls, and have no backs. Engineers debated the advantages and disadvantages of this: a fully enclosed tower provided secure storage and living space and could serve as a stronghold if the neighbouring sections of wall fell, but it could also harbour the enemy, consumed space and money, and made it more difficult to move supplies, earth, or artillery in and out in an emergency. This was especially serious in the sixteenth century where large firearms were becoming more important every year. The back of the same rondel as above. Photo by author. 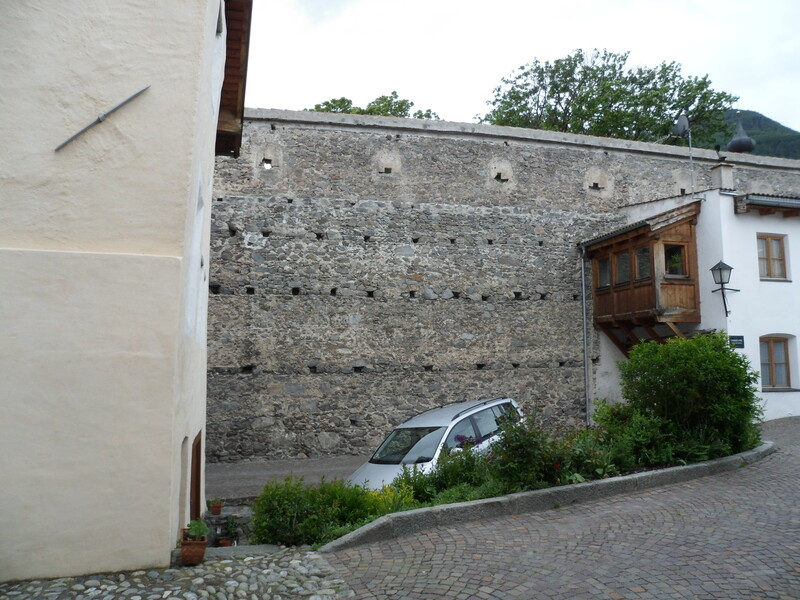 After the fortifications became obsolete, the rondel provided room for a small stage or concert space. 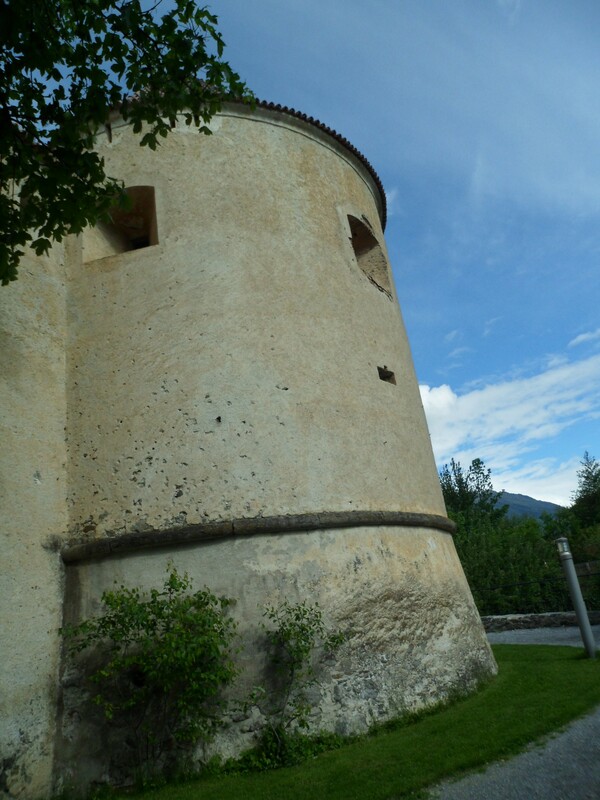 A loophole for firing along the base of the wall of Glorenza between the Malser Tür and the North-East Rondel. Photo by author. While the fortifications of Glorenza would have been more than enough any time in the past four thousand years, the sixteenth century was cruel to them. Gun-founding and carriage-making rapidly improved so that a well-equipped army could carry heavy guns over the passes and knock down a three-foot wall in days. The best solution was simple: fill the rondels with stone casemates which would support heavy guns, use man-power and ox-power to back the walls with earth and create a sloped embankment four or five metres high, twenty or more broad, and a kilometer long from the outer face of the ditch into the surrounding fields to protect the base of the wall against gunfire, and import a large number of cannon to destroy attacking machines and guns and kill enemies approaching the wall. Maximillian died bankrupt and his successors settled on tearing down the outer wall, knocking some loopholes in the walls for cannon, and hoping that the Swiss never came back. My guide tells me that the last modernizations were completed in 1570. The Malser Tür of Glorenza. Photo by author. 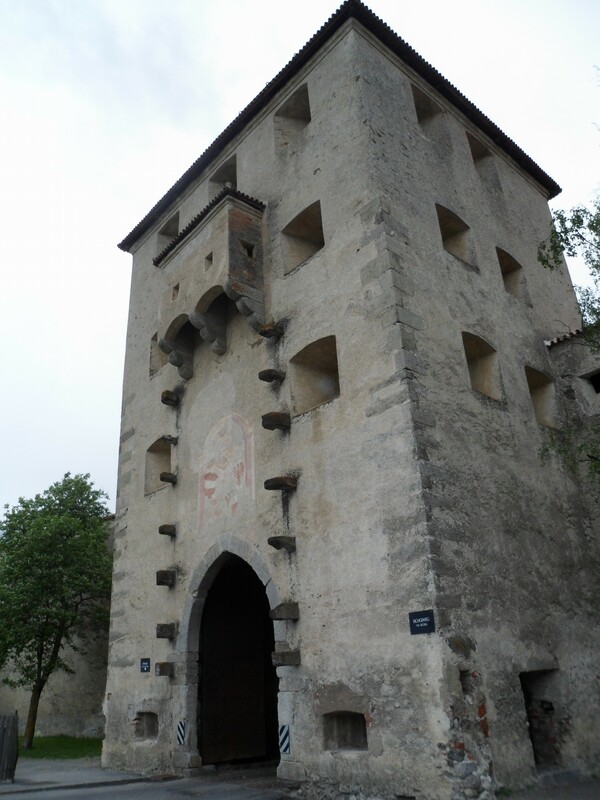 Glorenza has three gates facing Mals, Schluderns, and the bridge to the parish church of St. Pancratius. My gentle readers will have noticed that four walls and three gates does not match. The remaining direction is towards the pass to Switzerland, so from the architects’ perspective the missing gate was a feature not a bug. I think that the stone brackets once helped keep a drawbridge over the ditch from slipping to one side or the other when it was raised for the night. The ironbound wood Mälser Tür of Glorenza. Photo by author. The original ironplated wood gates have been preserved, although as most traffic in and out of town passes through the gate towers, I doubt that they have been closed in a long time. Iron plating added some strength against rams and artillery, but its special importance was preventing enemies from setting the gates on fire. 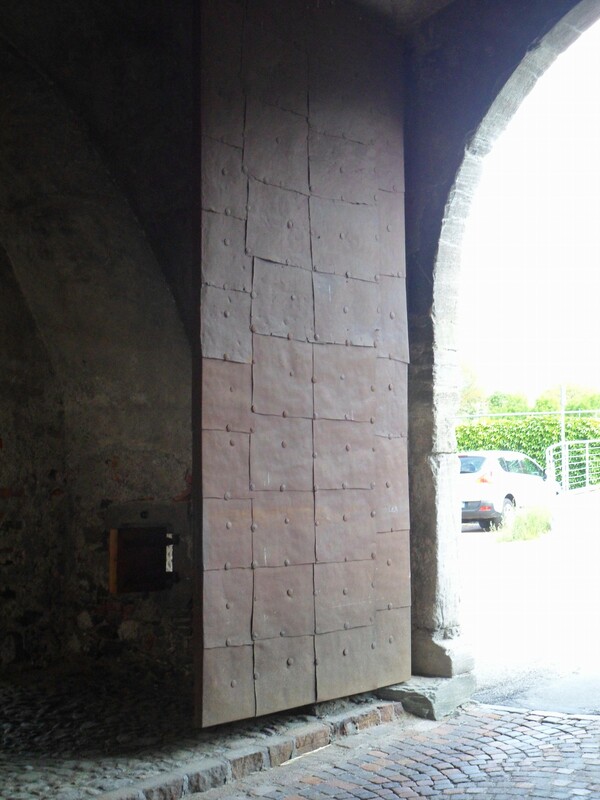 The Mälser Tür, set in a long wall without the protection of a river, has a protected gallery to drop water on any fires and stones on any enemies trying to break the gate with axes. Glorenza never flourished as Maximilian had hoped. Improvements in the Brenner Pass and the flourishing of Innsbruck and Schwatz continued to draw trade in that direction. After the Reformation the counts of Tyrol and the princes of the church were horrified by the prospect that the Vinschgauers might be infected by Protestantism by their fellow poor, rural Rhaeto-Romance speakers in the Swiss confederacy. They forbade travel, trade, or intermarriage with the Swiss and imposed the German language. 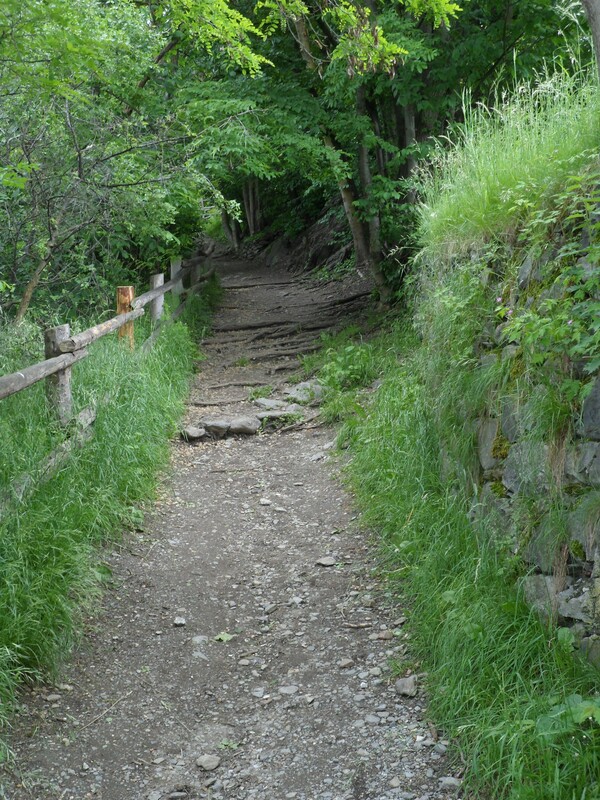 By 1625 a writer in Ravensburg across the alps complained that every spring the Vinschgauers sent children as young as ten hiking over the mountains to find work for the summer as farmhands in exchange for room, board, two suits of clothing and a bit of cash. These Schwabenkinder continued to make their annual treks for the next three hundred years. As often happens, a disaster for Vinschgauers was a blessing for antiquarians. The people of Glurns never filled in the space inside their walls, and never felt compelled to remove the walls to create space for railways or factories or suburbs. The only concessions which they made were to rent out the old ditch as gardens, and to knock one hole in the wall for a new bridge towards their parish church. An aerial photo from 1986 shows the town free of the suburbs in the direction of Mals and Schludern which have since appeared. The population is now about nine hundred, of which about five hundred live within the walls and the rest outside. About a mile downstream from Glorenza is the village of Schluderns, and above that village is a castle whose armoury is near and dear to my heart. I will blog about it another week, but right now I am tired. 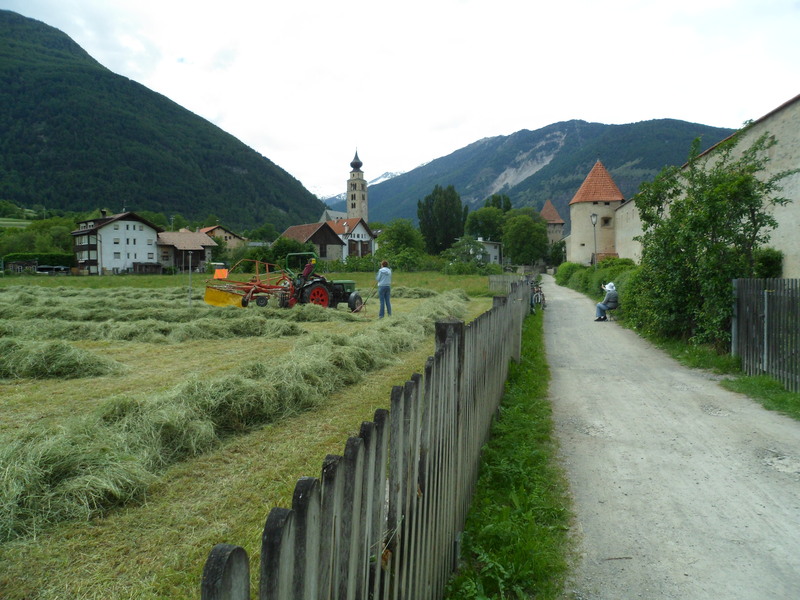 Further Reading: Glorenza: A Jewel in the Alps.